Heya! This is a seriously awesome mod, I can't believe I played with Pam's for so long without it! I have a small suggestion, however. Could we get something like a "chicken in a basket" that would work similarly to the cow in jar, but for eggs instead? Is it possible to make white kitchen counters? I figured it would be bonemeal, but that just reverts it to plain orangish. It would be nice to be able to make white. I love this mod, whenever I install Harvestcraft I always pair it up with this mod. I wish I could support you through patreon but I've got school in the way. Keep up the good work though! Any chance you could add support for XL Food Mod? Yes that would be awesome. Please consider supporting XL Food Mod. hi, i hope you having a good day. Would it be possible to set a whitelist on the fridge, counter, cabinet, fruit basket, tool and spice racks to only accept specific oredict items (meats/crops/etc. in fridge, fruits in the fruit basket, etc.)? This would fit packs the theme of the mod better IMO and would prevent players from using kitchen hardware as general storage. Could the sink provide filtered water when using Tough as Nails? Is there a good way of integrating the multiblock structure with applied energistics? There's a comment lower down that kind of hints at attaching the container blocks to an ME system with import buses, but that involves manually calibrating the buses to individually fill the containers with items, but there's just such an impossible amount of stuff from Harvestcraft and I find it to be really unwieldy, requiring a really massive amount of space for the kitchen. Basically I was wondering if there was an easier way of doing things like being able to pull directly from an ME system from the cooking block. If this is not currently possible, are there any plans of being able to do this in the future? Edit: IT DOES. If you have a "pantry" attached to your cooking table via a Drawer Controller... it works! Love this mod! It needs a very essential addition though: a chefs outfit. Or at the very least a chefs hat. There are things from Pam’s that I can’t craft in the cooking table!?!? Examples Dough and salt. I have everything I need but it’s just not an option in the table dough is easy but salt is monotonous and time consuming. Any ideas on what’s up? Are you on the latest version of both Pam's and Cooking for Blockheads? There was a change a few months ago that broke crafting of those items. Dang it lol yea i am. Also finding it doesnt like making vinigar or using it in other recipies. Has it, by chance, been fixed? When I opened the Cooking Table, I saw what looked like a text entry space, and when I clicked on it, I got a cursor, but when I tried typing, the game crashed. 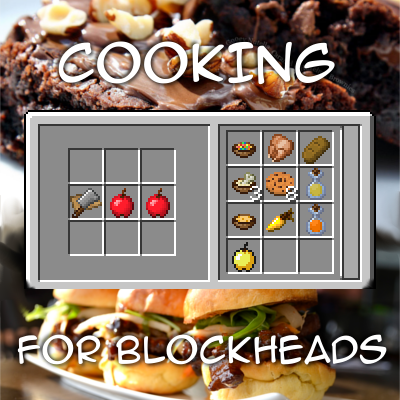 I'm using the latest 1.12.2 version of this mod (CookingForBlockheads_1.12.2-6.4.65). Do you have any idea why I crashed? I need the crash logs (shown in the launcher console or saved to a file in the Minecraft folder) posted on pastebin.com or similar in order to tell you more. Eep! I had thought I'd edited my last message, adding the crash report. I've added it below. OpenGL: AMD Radeon HD 8400 GL version 4.5.13399 Compatibility Profile Context 15.201.1101.0, ATI Technologies Inc.
That crash report does not seem to be related to Cooking for Blockheads, something appears to be broken within the vanilla recipe book (although it apparently happend within the inventory, not within the Cooking for Blockheads screen).